Cambridge Audio 650BD universal Blu-ray player on sale now for £399.95 | What Hi-Fi? Our review sample arrived last week and we'll be publishing a full test in the April 2010 issue of the magazine, on sale March 10th. 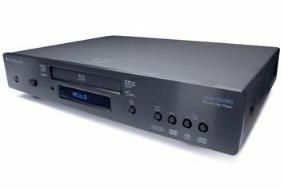 Just to recap, the 650BD will handle Blu-ray, DVD, DVD-Audio, SACD and HDCD discs. It supports all the latest high-definition audio formats, and uses 24/192kHz DACs. There's onboard decoding for Dolby TrueHD, Dolby Digital Plus, DTS-HD Master Audio and DTS-HD High Resolution Audio in stereo, 5.1 and 7.1 variants. The player is Profile 2.0 as standard, upscales standard-definition sources to 1080p and has dual USB ports so users can enjoy music, photos and videos transferred from their computers. A Set-Up Wizard is designed to make calibration easier, and the player has redesigned wraparound casework and a thicker front panel to match the new Azur 650R multichannel receiver. Energy consumption in standby is said to be less than 1W. See our special blog for more pictures of both the 650BD and 650R.